We are all familiar with excess. It is that monolithic line that shines with a fuzzy neon glow and beckons you to take an extra step towards extremity; for sometimes anything less than a lot just doesn’t seem to yield results. Yet that line is much too fine and often ends up washed away by the foamy waters of miscalculation, until the grains of salt is all that one can taste. It is safe to say that on this side of the musical spectrum we are on rather friendly terms with extremes; metalheads are the progenitors of twisting the knob up to 11. Alas, heavier, louder and faster doesn’t always make for a better high – regardless of how many die-hard, ketamine-soaked shredders might scream otherwise. A good balance is always better than a regurgitating overdose, and thus it is always a commendable feat when a band manages to create a record that is both brutally raucous and determinately resolute, and on “Remnants Of Decadence” the Netherlands Death Metal quartet ERASERHEAD are sifting through pits of depravity in search of that insane metallic equilibrium. Cue the bone-grinder…yes, it is one of those records; the titles of the tracks alone should paint a very clear and gruesome picture. Following a brief and cryptic intro “Collection Of Scalps” goes on to introduce us to the band’s mighty sound; which is comprised of a gushing barrage of fat riffs interlaced with urgent, blast-beaten chaos and tremolo-picked chainsaw anarchy. Yet amidst the typical Death Metal mainstays, the band also infuses their masterful carnage with some rather appealing Thrash Metal influences that provide this otherwise blatant insanity with some structure and accessibility. Tracks like “Digital Absorption” and “On Death Row” are grounded by SLAYER-inspired riffs and subtly melodic interludes, whilst “Teach Us Wisdom” and “…and Then He Turned the Gun to Himself” lay down a groove-heavy foundation amidst a hurricane of blistering Thrash Metal riffing and low, growled vocals. Unfortunately, even with the aforementioned collection of solid Metal staples to keep this album together, this record cannot help but fall apart at the seams. 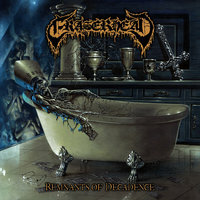 The Thrash influences do indeed give “Remnants Of Decadence” an interesting edge, alas, the incessant blast-beaten passages make a lot of the otherwise healthy Metal tracks – taking “The Manifesting of the One and Manifold” as an example – ooze with crudeness and amateurism. “Rise and Fall of Bellerophon” and “Limburgern Decadence” do manage to showcase some more of that earlier mentioned structure, but it is not enough to salvage the evident excess of tedium. The production on the record could also benefit from some additional effort. Whilst the mix is adequate – although the vocals do tend to have an over-prominent presence – the sound itself is dull and lacks the crispiness that would otherwise make this a pretty solid offering. Overall – this record has potential, but it requires a good cleansing for it to shine. “Remnants Of Decadence” is violent, heavy and Metal to the core – everything that one loves - but sometimes, we all just want (and need) something more.